It's been a long weekend here in Tasmania this past weekend. And by long of course I mean a good one with an extra day off work! Due to the long weekend I've been away and unable to update with a recap so we are a little later this week..
Codenames: Played it with 8 for the first time with 2 regulars, myself and 5 new players. As usual it was a success and always a good game for a fun night. 6 Players has always been my favourite player count, and after playing with 8 I still think 6 is a good number. There's a bit more chatting with 8 but it just means you gotta wait even longer to be the code master again and having the extra person on the team caused a slightly longer game with more conflict and discussion of clues. Also, I've had enough fun with the standard edition of Codenames that for whatever reason adding Codenames: Pictures into the library doesn't seem like something I'll do anytime too soon. Are pictures better? I wouldn't know as I haven't played it, but I don't feel its necessary to have both and I enjoy the standard edition just fine! Cash N Guns: The same night after codenames we finished on a round of Cash N Guns using the special abilities cards. Makes for a slightly longer game and takes away from it simplicity, but if you have a cool ability it definitely makes your game more fun. Unfortunately there's a couple duds that didn't seem as popular and the players with those weren't particularly fussed on using the abilities. Overall I personally prefer to play with the abilities as it adds just that little something to make things a little more involved - but either way you play it, Cash N Guns is a sure hit for a fun light game. Coloretto: A while ago I realized that while purchasing every epic big box game looks and feels amazing to have in the library - if you can't get them to the table often, it's pointless to have so many. As a result there's a fair few games I've only played once and a fair few I haven't had the pleasure of trying yet. So my focused changed to owning a game for every gamer - regardless of who it is, their age, experience etc my goal is to own a game I can bring out for any group. Coloretto is one I've yet to really play but I'm hoping it puts me that little step closer to my goal. It's quick, simple, colourful, in a small box and from what I've heard is fun. Look forward to trying it out! 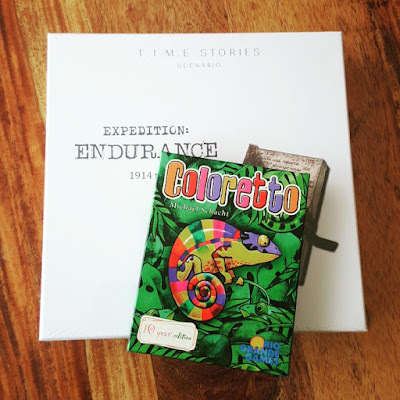 T.I.M.E Stories - Expedition: Endurance: I still haven't played T.I.M.E Stories after purchasing it when it initially came out. I just bought too many games at once and T.I.M.E seemed like the most invested and just got pushed aside. By the time I had got a group sorted, Pandemic Legacy came out and got played through instead. Months later and I've decided just to buy the additional scenarios so I can be ready for when we do finally get to play through it and as it seems difficult to find some of these expansions, I jumped at the opportunity to buy the newest episode even though I'm still missing two before it. I think we'll play these in release order and I think we'll also play these all through this calendar year. At least that's my goal.. Can't wait!